So, your district told you it’s time to start implementing a Close Reading Routine in your classroom, but there’s just one *little* problem… You have no idea where to start! For me, close reading all starts with a text. Today, I’m going to share my top five things to consider when selecting a text to begin your journey into close reading magic! Do you have a favorite text that you like to read? Chances are… you answered “No” to that last question. Passages DO NOT build a love for reading. The goal of close reading is to help students fall in love with reading- or at the very least develop an appreciation for the author’s purpose in writing a text. Build that appreciation through quality texts. If used correctly, you’ll see a huge increase in comprehension, fluency, and problem-solving skills. One of the biggest challenges with close reading is finding text that is appropriate for your students. Kindergarten students and fifth-grade students should not read and dissect the same text. It just doesn’t make sense! When first considering a text for your students, take into account the readability of the text. That’s not to say you shouldn’t expose your students to books above their reading levels, but keep it within range. In addition to reading level, take care to make sure the content is appropriate for your students’ age level. Language, mature content, violence, can all be intensified or lost in a text that’s been read again and again to a group of students not ready to handle the situation. For example, the book “Wonder” has become very popular in the past few years. This book explores many different sides of humanity and BEGS to be closely read. Fortunately, the fourth-grade reading level makes it a very accessible book for students as young as second grade. Unfortunately, the content may be too intense for a younger student. Often times, important lessons and undertones of a book can be easily missed when explored by a student who is too young for the issues addressed. Another key ingredient to selecting the best text for close reading is the vocabulary. Look for books that use “tier 2” vocabulary and offer options for students to explore new meanings of words. Often times, we think that students should know all the words in a text to appropriately read them, but when using a text as part of a close reading routine, challenging vocabulary allows for research to better understand the meaning. It also allows for deep discussion and analysis of the author’s craft when writing. Books should also include opportunities for students to experience vocabulary strategies first hand. Reading a book with prefixes and suffixes? Great! Now you can discuss how these affixes change the meanings of words right in the text. Shades of meaning, homophones, onomatopoeia are all types of words you should be on the look out for when selecting a text. There’s more to a book than just the words, so be sure to examine the illustrations and text features. Fictional stories should have illustrations that help to tell the story or even provide information the author leaves out. Former Caldecott winners make great close reads as they easily allow you to examine the purpose of illustrations as part of the “story telling”. For nonfiction text, be sure the text features provide additional information to the topic at hand. Connections to a book can be powerful. Use this to your advantage. Work to find text that has a relatable story line or covers a topic of interest to your students. You’ll be amazed at the level of engagement when you start reading about the history of baseball if your class is filled with batters, pitchers, and catchers. A perfect example is when I used the book “Crankenstein” By Samantha Berger, to introduce my students to close reading. All of my students could relate to the cranky protagonist in the story. The illustrations continued the story in a way that many of my students had missed the first time we had read it. They loved the book and I was happy I could teach our second grade standards in a meaningful and engaging way! One of the most powerful things a teacher can do is to share a book that he or she truly loves. Think of a book that you love reading. What makes that story so special, so enduring, that you want to read it year after year. These are the perfect books to share with your students. Not only will your love create interest around the book, it will inspire your students to love that book just as much as you! This is exactly what happened when we did a close read of “Olive the Other Reindeer” around the holidays. Many of my students had read the book before, and I had loved it as a “fun” read to my son and students around that time of year. After examining its many facets: the illustrations, use of onomatopoeias, and humorous undertones, the book had enough substance to be studied by my second graders. Of course, they fell in love with it too! With so many options of text, I hope these five tips help guide you in the right direction of where to begin when looking to pull books for a close read in your classroom. Looking at appropriateness, vocabulary, illustrations, interest, and familiarity are really only a few ways to check if a book is appropriate for close reading. If you feel the book has more than one thing to say and pushes your students to think outside the box, use that book to build a love of reading! 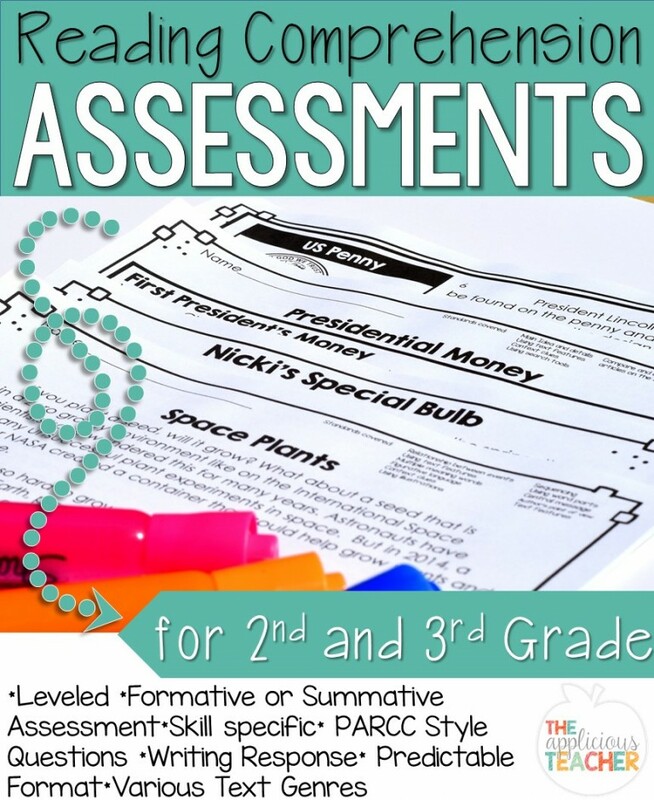 Want Close Reading lesson plans done for you? Check out my Close Reading All Year Bundle. This chunky pack gives you full detailed close reading and responding to text lesson plans month after month based on books I know your students will LOVE! Click the Picture to check it out!